Throat Blog — Got some Time? Well, I got the time, anyway. Go into prep around 10:30 AM. Surgery starts at 12:34 PM. Ok, so that sounds really overly precise at first glance. It is like saying 47.834% of all statistics are made up. But, upon a little reflection, that should mean that they actually have a minute-by-minute plan of action (even if I don’t have that plan to see for myself). I can imagine it, though. Well, finishing up my last day at work before hospital fun starts. Still haven’t heard specific times for the surgery, so I plan on leaving early before my PET appointment so that I can stop by the surgeon’s office (assuming I haven’t made contact before then). Throat Blog — How Much Will It Cost? Well, finally got a call from the hospital…but just about the upcoming costs (assuming my insurance pays and I have no idea why they would not pay). Pretty much the price of a small home freeze dryer. I’d used up a lot of my out-of-pocket expense cap leading up to this (2 CT scans, ultra sound, doctor’s visits, plus my annual physical and blood work back in January). Still awaiting a road map, which is top of my mind and which is what most people ask me. How long will I be in the hospital? How long will I be in Rehab? How long before I can eat? How long before I can go home? How long before I can drive? I know that many of those answers are the standard answer given by any good economist…”It depends.” (Most people don’t know that most of my elective business degree courses were economics…Money and Banking, primarily…they think I’m some kind of engineer or lawyer or bohemian geek.) Some general ballpark idea would be nice, though. Well, back to waiting for the next call. Throat Blog — Where Will I Be? Him: I’m in my office. Can we talk? I haven’t gotten a call, yet, but went and looked at the patient portal. Since no call, this might be tentative. PET Scan Inj Room: 3:30 pm. This is where they will inject me with the radioactive isotope. Pet Scan: 4:30 pm. This is the scan itself. Not much more to say (unless they call with a different time or date). Watch the blog for updates…I’ll give someone my admin info so that they can keep you updated. Ok, played with the CT scan data files at lunch and made a picture of my larynx cartilage in 3D. The image is rough-ish, as I don’t really know how to use the software all that well. 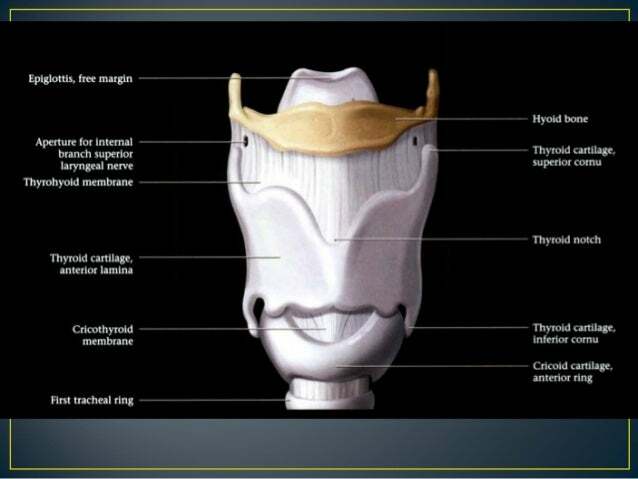 First, here is an illustration of the normal larynx. Here is what I extracted from the CT scan data, just the front portion of the larynx and only the cartilage/bone shows. Soft tissue, skin, etc does not appear on this view. From that you can see that the Hyoid bone is fine and the Cricoid cartilage is also fine (it looks rough because of my poor CT navigation skills). But, much of the Thyroid cartilage is missing. So, at the very least, the remaining Thyroid Cartilage needs to be removed and that area repaired. Whether more needs to be done depends on how nasty the tumor itself is and whether it has spread into any of the other cartilage. Long wait in the doctor’s waiting room. My fault. “You never get in early to see the doctor if you show up on time.” So, I showed up at 12:30 for a 2:30 appointment. Of course, I saw the doctor at 2:30. He scoped my throat again and went over the CT with me. I was really hoping he would give me his best Arnold Swartzenneger impression, but instead “It is a tumor.” But, without more testing, does not know what kind nor what treatment. So, scoping was followed by a needle biopsy. Hopefully final results tomorrow. But, preliminarily he feels it is narrowed down to some word that ends in “oma”. Could be carcinoma, sarcoma, or some other oma. Oma gosh. Treatment will likely be one or move of chemo and surgery. Surgery can be partial or total laryngectomy (goal is to keep enough to preserve speech and normal breathing through mouth and nose). But, can’t tell. He wants a PET scan ASAP. Well, ASAP turns out to be September 22. 9 days. Well, maybe. After I left and was on the freeway, my phone rang. Have I mentioned how hard it is to talk on the phone? Well, freeway background noise makes it impossible, so I pushed the call to voice mail. No message left, but the same number a minute later. So, I looked around but there was absolutely no place to pull over (I35 at the I30 west bound interchange). Call went to voice mail before I could pull over. No message left. So, I drove up to the first exit and into a parking lot. Checked email and saw I had a new message from the doctor’s office. They can’t just send you an email. You have to log into their portal. So I did that. The nurse said that she had an earlier PET appointment for me but didn’t say when it was, just to call her back. So I did that. And got her voice mail. No reply back by the end of their business day. I left a message and also sent a message through their portal to please leave voice mail next time. So, that is the news. Hurry up and wait. Well, this is going to cover almost 2 months then I will (as I am able) update closer to real time. I woke up at about 3AM with sudden pain on the right side of my larynx. I would call it a sore throat, but not sore on the inside like you get with strep. More like if someone had hit me in the throat a couple of weeks ago and it still ached (not that I’ve experienced that personally). Not horribly painful, but odd, so I consulted Dr. Google who told me that all kinds of sore throats are typically caused by a virus and resolve on their own within 2 weeks. Ok, so I’ll wait a bit and see what happens. Ok, a quick digression. I know that this makes me some sort of elitist, but my personal physician is part of MDVIP, a concierge medical practice. I probably would never have even considered such a thing (it costs extra out of my pocket that isn’t insured) but I’ve had the same personal physician for over 35 years, and he is very good(1). So I followed him when he joined. One of the benefits of the practice is virtually immediate access to the doctor when I need something. So… Was sitting in front of the Dr’s office at 8AM when they opened. At 8:15 AM I was in an exam room talking to him and describing the symptoms. He assured me that the side affect that they were worried about has actually only ever occurred in rats so was unlikely (despite what my sister says) to be what was causing this. We agreed to give it another week and see if it resolved on its own. Ok, it didn’t resolve, and now I’m getting hoarse. So, revisited my Dr’s office (8 AM) and got a shot of Azithromycin and a prescription for a Z-Pack. Looking more like some kind of bacterial infection. Over the course of the next week, hoarseness increased. Since this is continuing to get worse (more hoarse), my Dr. ordered a CT scan of my sinuses plus a ultrasound of my throat and referred me to an Otolaryngologist for follow-up. My voice is almost completely gone when I have my first appointment with the Oto(2). He ordered a course of methylprednisolone and rescheduled for 6 weeks. Communicate well if there is any background noise. Make myself heard in meetings without slapping the table. I never noticed how often we talk over each other. Not in a bad way, it is just that if we have a lively conversation, we can all hear each other even though sometimes we are all talking at the same time. So, no lively conversations for me. Everyone has to stop what they are doing to try to hear me. So, I’m more and more just letting the conversation flow around me. I also find that a fair number of people unnecessarily whisper back to me. Unusual infection (radiologist thinks unlikely since surrounding tissue is not inflamed, but he did not know I’d been on Z-pack and steroids, which would have reduced inflammation, so I think it might be a bit more likely…and is really what I hope it is; have you ever wished you had an infection?). Benign Tumor. This is what the radiologist felt was most likely and agrees with what my Oto said. Malignant Tumor. Radiologist felt that it was extremely low probability. After trying unsuccessfully to arrange for an appointment over the internet and phone, I give up and drive over to the hospital. I really want an appointment TODAY! Whatever this is, I really, really want it to be fixed ASAP. But, the Dr I was referred to was totally booked up for weeks. We found one of her associates (Head and Neck Oncology, Surgeon, (3) ) who could see me on September 13. That was the best they could do. So, I took it. I also made a copy of all the files from the CT scan for myself and found some cool software that would 3D model the scans. Probably shouldn’t have done that. Found for myself that much of my thyroid cartilage has been affected by whatever this is. At a minimum, this is going to mean surgery to reconstruct, and a down time of weeks (ok, this is my prognosis, not one made by a medical professional, so am probably working myself up more than I should). It could also mean either partial or complete removal of my larynx, which would put me out for 2-4 Months. With the above in mind, I started contingency planning at work. I have a couple of categories that could be picked up by one of the other Product guys, but one is so specialized, it is going to be difficult to cover. So, I provided my management team with my suggestions of who to go to for help if I am out for that long. I have been madly thirsty all weekend and feel a little shaky, so I visited my primary doctor again this morning. I also wanted to be sure that he had a copy of my CT scan and let him know that, even though the Oto was my referring physician, I was going to tell UT Southwestern that they should really consult back with my primary. I saw the Oto (who seemed very good and professional) only 2 times. I’ve seen my primary uncounted times for over 35 years. Plus, he has additional resources available through MDVIP that might be useful (like access to Cleveland Heart Clinic, MD Anderson, Mayo Clinic, Baylor College of Medicine, etc). Of course, I had consulted Dr. Google again over the weekend. Since my throat was involved, I concentrated on causes that could be related and found Hyperthyroidism is one possibility. I also told my doctor that I was completely open to it just being anxiety, as well. So, my doctor ordered some blood work including thyroid function so that I would have that on hand for my UT Southwestern visit on Wednesday. Labs came back and only slightly elevated TSH. T3 and T4 were fine. So, the thirstiness is most likely due to anxiety (could also be low blood sugar…Ok, I’ve got to stop Googling this stuff). Appointment is tomorrow. Really wish it was yesterday. Other than not having really cleaned my house, I’ve prepped for a stay at the hospital. Cat is good for at least a week (automatic feeder, automatic litter bot, 1 liter of water plus left the lid up :), and he’s used to the mess). I have a hospital bag (sweat pants, loose shirts, slippers, personal care items) packed and in the car. Got a silent travel guitar in there, too (practicing some would certainly be better than Googling, assuming I have that kind of time to kill). I don’t really expect to update before my appointment tomorrow afternoon.